Don’t believe your lying eyes — Australian newspaper archives are full of temperatures recorded higher than 121 in the shade which is 50C. All of these temperatures in the map below are found in historic newspaper archives. Measurements done after 1910 are even done with official Stevenson screens, yet the BOM “throws them away”. It’s true that ones done in the 1800s are often recorded on non-standard equipment, or are just literally “in the shade” under cover. So some of these, perhaps many, are one or two degrees too high. But even if we take two degrees off, how scary is global warming when Australia knew many days of 48C and 49C and some at 50C 120 years ago? The BOM — supposedly so concerned about the State of Our Climate — show little interest in talking about our history or in analyzing it, or even mentioning it. In 1939 outer Sydney reached 122F or over 50C – recorded at Windsor Observatory — a place that had had a Stevenson screen for around 40 years at that stage. 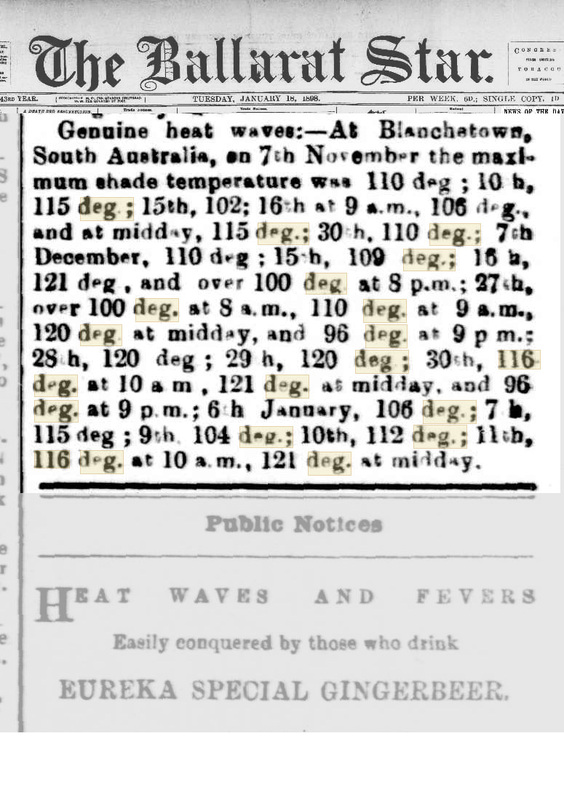 Without fanfare, the Ballarat Star in January 1898 notes that there was a “genuine heat wave” in Blanchetown SA in November the year before. Temperatures of 120 and 121 are recorded on four days that month. All these measurements are wrong? Contrast that with last week when towns in the outback reached 48 and 49C and the Bureau of Meteorology senior forecaster Michael Efron said — “They are pretty incredible temperatures.” Seriously. It’s hard to believe that after a quadrillion megatons of emissions we are nearly as hot as we were in 1896? It’s as if hundreds of measurements of similar temperatures across four states of Australia and on many occasions from 1828 to 1939 don’t even exist. The worst heatwave was probably January 1896 when the nation was “like a furnace”. From a post in 2012: All these measurements are wrong too? It is as if history is being erased. For all that we hear about recent record-breaking climate extremes, records that are equally extreme, and sometimes even more so, are ignored. In January 1896 a savage blast “like a furnace” stretched across Australia from east to west and lasted for weeks. The death toll reached 437 people in the eastern states. 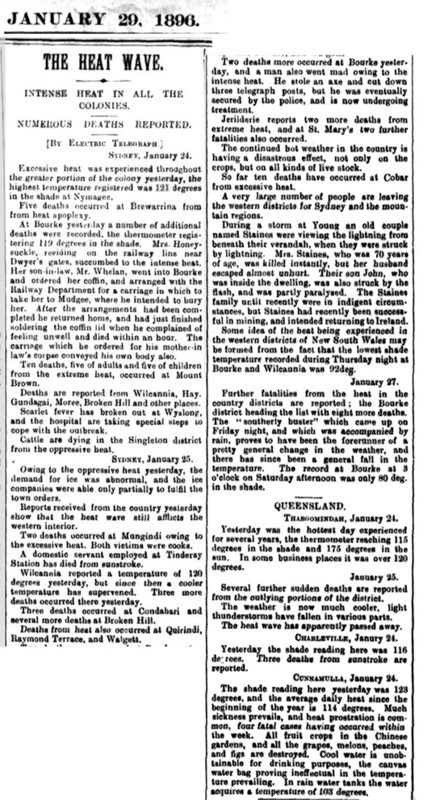 Newspaper reports showed that in Bourke the heat approached 120°F (48.9°C) on three days (1)(2)(3). The maximumun at or above 102 degrees F (38.9°C) for 24 days straight. By Tuesday Jan 14, people were reported falling dead in the streets. Unable to sleep, people in Brewarrina walked the streets at night for hours, the thermometer recording 109F at midnight. Overnight, the temperature did not fall below 103°F. On Jan 18 in Wilcannia, five deaths were recorded in one day, the hospitals were overcrowded and reports said that “more deaths are hourly expected”. By January 24, in Bourke, many businesses had shut down (almost everything bar the hotels). Panic stricken Australians were fleeing to the hills in climate refugee trains. To get a feel for how widespread and devastating it was, read through just one report in one paper (there are scores more). The Warwick Examiner, Jan 29, 1896. Click to enlarge. Thanks to Chris Gillham, Lance Pidgeon, Ken Stewart, Warwick Hughes, and all the BOM audit team. MSN has breathlessly been reporting a ma of 46.2C in Adelaide…. I wonder where thye measured it at? Urban heat island maybe? Has the power tripped yet? I have this mental image of people standing in front of bird shredders, huffing and puffing to keep their aircon going….with a large flash on the horizon as the Big Battery fries…. “Adelaide has set a new heat record, smashing the previous one reached in 1939, hitting 46.2 degrees Celsius this afternoon. Heat records began to tumble throughout South Australia earlier today. So far, 16 locations have hit record temperatures including Adelaide Airport, Minlaton, Noarlunga, Snowtown and Port Lincoln. The Bureau of Meteorology (BOM) is tipping more records will be surpassed this afternoon with Port Pirie hitting 40C and Adelaide reaching 35.8C by 9:00am. What if, in fact, the high temperatures are not records? Both tails of the distribution are long. Having moved ever so slightly away from the low end, then records have a larger probability of being reached on the high side. If this is not happening, then it is a good argument for no global warming. Note no assumption is made in the above regarding why the average surface temperature might have warmed. Does anyone know or has sighted the BOM gauge in Adelaide? Seems to me to be the first place to look to verify or disprove the BOM data. Yes, I’ve seen the new West Terrace site. It’s on the grounds of the high school my sons went to. I also know the “old” one at Kent Town. Believe me, these records can be taken as real today. How new, was there a period when old and new were operating side by side…. I guess I am suspicious of NEW technology and the scope to adjust the system to read what the installers want! Is there a spike starting from when that NEW system was installed? States that the West Terrace system re-opened in April 2017…..
Ironically, if they hadn’t been so keen to go back to West Terrace they could have claimed 47.7C at Kent Town as the new record for Adelaide. It looks like standing at 46.6C. Kent Town is not the greatest spot, located next to a car park. I can vouch for Ian Hill being worth listening to on this matter. He is a long term local there and was kind enough to take me for the guided tour of these and other Adelaide temperature sites before the new version of West Terrace was built only slightly to the West and down toward a freeway from where the old site was. I reckon Ian’s gut feeling would be accurate to half a degree C or better but the new BoM equipment may not be that accurate. What the BOM is doing in Adelaide is obfuscation at least. They have old thermometer records from West Terrace. The have records from ‘New’ electronic system at West Terrace. They have records from a different site, Kent Town. They then join the dots as if they were a continuous data stream. They don’t even tell anyone that the new record is from a system less than two years old. They don’t provide a data stream showing the history of temperature recording in Adelaide, showing when the instruments were removed, replaced, shifted, re-sited….. They wonder why they are becoming a laughing stock. Just think about the standard deviation error bars introduce when statistical analyses of temperatures and the chances of forecasting tomorrows weather accurately from such a miss mash of data. But then they are good at extrapolation…. The most important thing that is not shown from Adelaide and the reason we went there is the data from 1856 to 1887. At that site some of the best readings anywhere in the world were taken by sir Charles Todd. He took readings in a very standard Greenwich Glaisher stand in the exact same spot from 1858 til his death and they continued to be taken til 1946 or 48 (long after his death). Beside that he built his own round house design that recorded very similar temperatures to modern Stevensons. 1887 was NOT the beginning of the long running parallel comparison there and the most important part of the comparison is the swinging sling thermometer he compared all the screens to. Also important is that there was more than one Stevenson design there in the side by side line and they read different to each other. What is also important to realise is that high maximum temperatures DISPROVE GHG theory. The cold minimums are supposed to warm faster. So what is missing is evidence of natural variation that may even show cyclic behaviour. These hi maximums help to demonstrate that CO2 is not the cause. Thanks Lance, that seems a long time ago now. The new West Terrace site is between some cricket ovals about 150m west of the Adelaide High School buildings. The old West Terrace site was situated literally on West Terrace and I recall there was a tall but thin building to house the BOM administration until 1977. I think they kept observations going there until 1979. I presume the current offices are still at Kent Town but may need to be updated on that. They no longer need to go out and make manual observations. Today’s Advertiser proudly proclaims Adelaide to be the World’s Hottest City but there isn’t much competition this time of the year! Excluding some other SA cities hotter than Adelaide (eg Port Augusta, Port Pirie, Whyalla), second on the list is Alice Springs (42C), then Melbourne (41C), then a whole bunch of cities near the equator between 31-33C. Big deal! I was under the impression that the BoM office was just west of Adelaide on South Road, but Google says they are in King William St. near South Terrace. They are certainly not in Kent Town as their lease there expired before that on their site next door where the measuring took place. for a picture of both in the West Parklands of Adelaide. This shows a picture of the Greenwich screen, the Round house and the Glaisher screen. The tall building Ian Hill mentions was the Adelaide Observatory. When the Adelaide Boys High School wanted more space, the Observatory was closed down and the equipment transferred to the Adelaide University Physics Dept. I was told that the BoM did do some comparison between te old site and the new one in Kent Town for some time, but cannot verify that. There was a BoM building on West Terrace. When a ‘seer’ claimed that he foresaw waves lapping West Terrace my father rang the Weather Bureau and said “I have a silly question”. The receptionist promptly said “196 feet (above sea level)”. Hey Ian. There seems to be some discrepancy (who would have thought?) between the official BOM listed highest temperature for Adelaide, and what the Advertiser reported for the 12th of Jan 1939. Reported in the paper the day after the 12th, the high temp was 117.7°F (47.6°C). So who is right???? Thanks to Lyall, a good client of mine who has an amazing memory. So, was it a record….or not! Graeme No 3 and Slithers. There is a better picture here. The Scroll down a way. It shows two of the three known Stevenson screens and the far better round house. Sadly it does not show the all important sling thermometer in use. That is the 1939 temperature recorded in the Glaisher stand. The BoM temperatures are from one of the Stevenson screens. ALL the screens read different temperatures to each other. So Both are correct. See figure one here. It is a chart showing the difference between the Glaisher and each of three Stevenson screens your 1939 date is included. Ian. I have a question re Kent Town site. At some point a flood light was installed on the adjacent power pole to illuminate the instruments (within 3 to 4 metres). Any idea when this may have been installed? I do wonder how much heat would be emanating from it onto the thermometer. Was it there in the seventies? Or maybe installed in the nineties? I didn’t know about the flood light RGB. I imagine it was installed early on when the observers realised they needed it probably for safety reasons. The site had several different instruments including an evaporation “pan” I think it’s called. I expect the flood lights were only turned on to make observations at night, so any heating impact would be negligible. I have several photos of Kent Town taken when I became involved in a project to rate observing sites across the country, about eight years ago. I’ll dig them up to see if any included the flood light. Thanks Lance for answering the other questions. RGB asked above – was it a record or not? I’d give it the same credibility as new records claimed in Melbourne and Sydney in recent years. Comparing different sites and different eras. Like trying to compare sporting performances from different eras. The automatic thermometers have changed the game. The answer has to be no more than a guarded “perhaps”, but the media will not let the facts get in the way of a good story – remember last week they had Port Augusta at 52C after someone misread the minimum temperature – and the story was not corrected at all! One thing which is fairly persuasive of it being SA’s hottest day on record – it was very hot everywhere. I was stunned to see Hindmarsh Island record 46.7C. Even Neptune Island recorded 34.2C. Over 50 places recorded over 40C, most over 45C. Depending upon the type of flood light and distance it could have an effect upon the 1 second overnight low as recorded by that instrument. The BOM is crazy to use the default 1 second temperature measurement. In the USA they have a 2 minute smoothing, in the UK they have a 5 minute smoothing. Leave the flood light on all night and get a warmer than average overnight low….. Thanks Siliggy for the Hughes paper. Most illuminating. Seems the Advertiser has always been choosing which “facts” to report on, just to sell the “news”. It should also be noticed that the newspaper minimum temperatures reported from West Terrace were also from the Glaisher stand which read colder numbers than the Stevenson due to the specific heat of wood keeping the box warm overnight. Ian I can remember you and i found so many problems with the Kent Town site being tightly crammed into a Suburban area. I think the overnight minimums there would be riding the daytime heat being slowly released by all the tarmac and concrete about it as well as the air conditioning outputs you mention. Can you remember me asking you to stick your hand in the sunlight reflected from the BoM building windows. We felt a lot of extra warmth. The sloped windows on the front of that building would have reflected the sun at the screen and everything around the area at certain times of day. A hopeless site. Yes, although paradoxically it did record Adelaide’s coldest minimum temperature, at -0.4C, on 8 June 1982. If the floodlights were used for safety reasons then once the automatic thermometers were installed, and everything else became automated, then they wouldn’t be needed. Maybe I’ll drive past the site at night while it is still being used for observations to see if they are on. Can’t tonight unfortunately. Well here is an example of the papers showing a cooler minimum temperature from the Greenwich Glaisher stand. I have just been to the Kent Town site to look at the floodlight and it was on, clearly as a security measure. Probably stays on all night. However the light is about 20 metres from the Stevenson screen and it is hard to imagine it would affect temperatures from that distance. The old BOM building has been converted to apartments and there seems to be a new and tall apartment building to the west, further boxing in the site. No wonder the BOM moved. Most electronic thermometers were rolled out around mid-1990s. They can detect spikes in temps much more effectively than the old mercury thermometers. I have seen up to a 1C change within the same minute. There is no way you can compare the old thermometer readings with those ET recorded today. Note the increase in temps from around the mid-90s. While they claim to have matched the cooling and heating rate of the body parts of those Platinum resistance thermometers, they always seem to be mounted closer to the front of the screen than inglass thermometers were in photos of screen internals. Try this simple experiment. Put your hand on the inside wall of a normal human house on the Northern side of the house in the afternoon. Then compare how warm it feels to an inside wall on the southern side of the house. I’ bet this helps those rapid spikes along. Looking at those graphs with a jaundiced eye like mine one could easily pick out when the equipment was changed, especially when the graphs always go UP at the relevant year!!! The Melbourne graph makes the point as there have been no lows below the datum line since the NEW equipment went in!!!! Slithers. What you are seeing is real and was indeed partly caused by the introduction of the platinum resistance thermometers. The BoM have even stated this in some publications. They went on to adjust the amount of metal in the body of the probes through several poorly documented revisions after that however to match the behavior of the probes to the mercury maximum thermometers. A silly thing to do because this means they do not match the alcohol minimum thermometers. You need to see that averaging samples over a minute or five cant solve the problem of two different thermometer types either. It is a worldwide mistake that they have ALL trucked up. The BoM are just being non standard about messing it up differently to the others. Sampling rate is not the issue. That is just confusion that people with little electronics understanding mess up. Faster sampling is always better. I think they should sample 1000 times a second. The problem is the averaging. The only solution requires two probes. One for minimum and one for maximum. Another issue during the same time is the screen design change. This is the big one that needs to be looked at and it is what you see remain in those charts as well as the impossibility of bringing mercury time constants into line with Alcohol. I should not say that the only method of simulating two different thermometer types requires two probes. The high rate samples could simply be fed through two different averaging processes either time constant or flat fixed time averages to get two different results. But if the time constant averaging is done only mechanically via adding specific heat to the probe body the way the BoM do it then there does need to be two different probes. Suspicious of new technology , you say. So I suppose you get your information from the town crier, go to a doctor who uses leeches, and if you feel like a holiday in Europe you take a sailing ship? I’m puzzled a bit how you put your post up here without using new technology. That is the West Parklands site which is close to the site in 1939 when the previous record was set. The original site for over 100 years was switched to Kent Town (about 3 kms. away but in a built up area) It recorded 46.8 and 47.1 at the last 2 times. The Adelaide Airport reported 44.7 and 44.6 for those times. Parafield (the old airport) reported 46.4 and 46.6 for those times. The BoM are now claiming that it is the hottest on record for 130 years. That would, by my calculations, mean records started in 1889. Since there was a Stevenson screen installed at the old West Terrace site before 1880 it seems some comparisons have been ignored. Supposedly there were no Stevenson screens in Adelaide before 1887. Clement Wragge had a paper accepted by the Royal Society based on Stevenson sceens in Adelaide (West Terrace) and on Mt. Lofty. That was about 1880 before he went back to England then to Qld. I wonder what the temperature were like in those missing (and non digital thermometer) years? I just finished a book** about the Dust Bowl Years in the USA, roughly the 1930s. Some of AU’s hot spells were also in the 1930s, I think. Has anyone thought to collate all the newspaper reports going back over time and then compared the temps to the “official” data. The reporters in the “olden” days would report the observed temperatures as supplied by the authorities of the time before anyone thought to adjust the data to fit the narrative. I know it isn’t totally scientific but as an indication of what the temperatures were in the past (as reported at the time) there may be some “interesting” comparisons to the “official” records. Stuart, please hunt away and send me the finds. There is so much in there, I feel I have only scratched the surface. Melbourne – 47.2C in Feb, 1851. Of course this has been adjusted – down! News headlines – Adelaide just reached its highest temperature ever, at 46.2C, except that it isn’t – yet. My ABS Year Book from 1974 says the highest ever was 47.6C on 12th January 1939. That’s at the “new” West Terrace Site at 1:43 pm. Kent Town just reached 47.1C at 2:35pm, certainly the hottest there since it began in 1977. Hasn’t reached 50C anywhere yet but Tarcoola (48.8C) could get there! So at age 64 I finally get to experience the same heat (in Adelaide) that my granny talked about fifty years ago when she referred to ’39! The BOM site just refreshed – now 47.5C at Kent Town, and 46.3C at West Terrace! And the point is, it is no hotter today within the margins of error. Looked at in these terms Australia has spent $10′s of billions on ‘science’ and renewables for no reason at all. Correct. I just turned my A/C on and it occurred to me all the heat being ejected outside by hundred of thousands of units across Adelaide did not occur in 1939. So does that mean we can decrease the temp by the heating effect of all those aircon units? And buildings, roads and cars and it’s all recorded on electronic super sensitive equipment that only hits the peak for 1 second and “that counts”. So yes, current temps likely to be artificially warmed. Oh dear! It appears BOM’s memory holes need an upgrade if they are to continue the CAGW scam. The temp in 1939 was .5 degree c less than the new record, didn’t the switch from glass thermometers to electronic result in a change of +.5 degrees? therefore top temperatures have not changed for SEVENTY years despite CO2 rising. Most of these temperatures are from the Federation Drought of 1896-1903, which the Bureau of Meteorology has tried to airbrush from our history books. They simply do not want the public to know that measured temperatures back then were generally hotter than today. 2/ nobody realises they have adjusted down the early ACORN-Sat temperatures of ca. 1910 by as much as 1 degC (by “homogenisation”) – to now be able to point to the Global Warming effect. BOM is truly a rotten corporation. What did the BOM say when this was submitted to them ?. There are many ways of submitting things and I agree if you were going to submit it then the BOM would be first in line to receive the submission. That is of course it was within their area of interest or expertise. Sometimes when things are submitted they go to the wrong destination and get dumped in the waste paper basket. This brings us to another issue: Waste. Where things are submitted in paper form the paper inevitably winds up in the WPB which is the acronym for waste paper basket. Talking of acronyms, that of the Bureau of Manipulation, BOM, seems to be overly denigratory considering that its sole task is to observe, record and store details of the weather. Since it is not possible to “manipulate” the weather I don’t think this is correct and feel that something should be done. Curent power vic $11,499 sa $10,215. 1600mw from hazlewwood would be useful right now. Wind under 20% capacity, about 1,100MW,what a joke. Can somebody with appropriate detailed knowledge confirm (or correct…) this: old style mercury thermometers indicate absolute temperature off a spot; the thermocouples sense the difference between “hot” and “cold” junctions, so where the indicator is positioned in the air-conditioned office it may show a bit more ? What about thermistor-based systems ? Vlad: First, I think virtually all modern weather stations use resistance type sensors (thermistors or RTDs). Thermocouples rely on the Seebeck effect which is produced when two wires of different metals are connected at both ends. Heating one junction produces a voltage that is proportional to difference in temperature between the two junctions. To measure temperature one junction is made into a reference (i.e. known temperature) junction by placing it in ice water for example. A high impedance voltmeter is used to measure to voltage with no current flow. Of course using an ice bath for the reference junction is not very practical, so modern instruments create an electronic reference junction. The temperature of this reference junction is typically measured by a thermistor to make the appropriate compensation. Thermocouples are typically only accurate to +/- 0.1 to 1.5 C depending on type. But to answer your question, no the temperature of the room the readout device is in should have no effect. But the “room” the thermometer is in, matters a lot. Some are in old big 240L Stevensons. Most are in new 60L ones, or other smaller arrangement. These have different lags and response times to heating. Is that the forecast price or the actual paid price ? Just posted another thread today for the prices. Watch that money burn! Thanks Robber, the forecast has actually now become the actual spot price. Now $14,500 for Vic and $113,481for SA. Wonder how many jobs this is costing or how many elderly are under severe stress. Thats $13,481 for SA. Typing on a tablet with a bandaid on one finger. AEMO Intervention Event, Reliability and Emergency Reserve Trader (RERT) – SA1, VIC1 Region- 24/01/2019. AEMO has dispatched/activated reserve contract(s) to maintain the power system in a Secure and Reliable operating state. The reserve contract(s) was dispatched/activated at 16:30 hrs 24/01/2019 and is forecast to apply until 19:00 hrs 24/01/2019. In other words AEMO is paying people to either curtail their own demand or to bring diesel generators onstream – yet still those emergency generators in Adelaide SATGS1 and SATGN1 have not been activated. “South Australia’s emergency diesel generators are likely to cost taxpayers $610 million under a deal signed by the former Labor Government”. Meanwhile SA and Vic wholesale prices have just risen past $2,000/MWhr, with forecast peak of $14,500 later today. Meanwhile as AEMO struggles to meet the coming evening peak of 31-33 GW, that Wonderful Wind is delivering 1 GW from nameplate of 5.5 GW. Quick, more windmills, blow harder! Looks like BOM has been busy using their memory holes again (re Orwell’s novel 1984). BTW Jo, the Highest Astronomical Tide last Tuesday in Moreton Bay, following the super-blood-wolf-moon was ~ 6inches lower than it was in 1946. Now it is getting interesting, the vic nsw interconnectors appear to have tripped, possibly due to bushfires. Still $13.5k / $12.5k power in vic / sa. Be nice if we could audit the weather stations around Australia. I’d be happy to check out my area. Photographs, locations, heat sources nearby etc. Agreed. Even better if we can raise funds to put our own thermometers next to theirs to get actual raw data side by side. (Exactly what we pay them to do but they won’t provide even with an FOIA). Can I find out where (address) the stations are located from BOM somewhere? Is that publicly available? Yes. Go to http://www.bom.gov.au/qld/observations/map.shtml (that’s for Qld but there’s one for each state). Click on the town name and you go to the latest observations. At the top are details of location- not exactly accurate but fairly close. E.g. Station Details ID: 038026 Name: BIRDSVILLE AIRPORT Lat: -25.90 Lon: 139.35	Height: 46.6 m.
Thankyou! There a 4 within close driving distance. I will check them out. “”Melbourne’s all-time overnight record is 30.6C, so it’s getting pretty close.” – I remeber as a teenager hearing cicadas going all night growing up in the Riverina. Cicadas dont sing until its at least 30C…. “BOM Victoria’s Richard Russell said temperatures in parts of the state were going to be “nothing short of oppressive”, particularly in northern Victoria where it is expected to reach the mid-40s. Mildura is forecast to reach 44C, Bendigo 41C, Wangaratta 41C, Warrnambool 39C and Melbourne 36C. “We’ll see those conditions spread across most of the state for Friday [with] incredibly high minimum temperatures on Thursday night… in Melbourne we expect the minimum temperature to only get down to 29C, much of the state will barely dip below 30C during that period,” he said. The heat is proving harder for some, with about 2,700 houses in the central Victorian towns of Nagambie and Avenel left to battle an anticipated maximum of 41C with a power blackout. AusNet said a fault with an underground powerline would take several hours to repair, with power expected to be connected by late afternoon. The power outage has caused the closure of the public pools in Nagambie and Avenel, and the local council has set up a relief centre to help people escape the heat. The power company said crews were working to install a generator in Nagambie, but it is expected to only service 400 customers. We have had consistent temps in Auckland of around 23 – 25 ° C for most all of this summer so far, which makes this a cool summer. There are no, none, zero, zilch, nada cicadas singing (now 12:10 pm). Temperature is 22 ° C (slightly rounded up. Metservice claim 21.8°C). Sky is almost completely clear of cloud, and there is a fitful light breeze, so it’s effectively a sunny day. Normally cicadas would be singing in a massively mass chorus of hundreds/thousands by now, going all day and night. They usually start about a week before Christmas. I heard one then and it seemed to have a flat battery, starting and stopping. I heard another one on Wednesday afternoon this week. (temperature peaked at 27 ° C then at about 15:00.) It too had a “start up problem” and it was the only cicada within audible range. On the local weather forecast last night, we were `warned’ about an impending `heat wave’ with all the `red-hot’ air from Australia crawling across the Tasman. It could (shock! horror!) reach 28 ° C by early next week! Que? 28 a heat wave? From past experience, 35°C plus could qualify, just barely. We should have had temps of around 30°C most days for most of this month, but it isn’t there, yet. Who turned the sun down? Photographed my work vehicle’s max exterior temp reading today at 2 pm – 30.5˚C (modern Mercedes van so vee know it’s green-approved unt Angela-accurate, ya!). Was hovering between 23˚ and 29˚, depending if we were by the beach (sea-breeze) or inland in a sheltered valley (micro-climate), until I parked in a vineyard’s car park (small tarsealed area amidst vast vines / greenery / paddocks) and bingo! the magic thirty-and-a-half degrees, before settling back on 29˚. And the cicadas were singing, monarch butterflies were flapping, dragonflies were inquisitively hovering, bumble-bees were bumbling, hawks were hovering, a few tourists were stumbling, and my guests from Melbourne were happy they weren’t home in the 40+˚ heat. * Silliest news headline I heard on the radio this arvo: ‘Australia hit by the second heat wave in one week!’ The what!? Back home from Waiheke Island, I checked the BoM’s site and, apart from Victoriastan and the Apple Isle, it was kinda chilly in the Land of Oz: Perth maxed on 27˚ and Sydney Harbour 25˚C… while at the ‘bottom end’ of NZ, Invergumboot topped out at 16˚… ™sizzling™ appears to be their latest novelty doomsday word. He said Flow Power’s customers were keen to participate and earn revenue. Last summer, AEMO called on 1411 megawatts of backup power through this mechanism, at a cost of about $52 million. AEMO had earlier in the day stepped back from its prediction that the lights could go off in Victoria in the early evening, instead saying Friday now looked like a more critical problem. Victoria is now facing a power shortfall larger than Australia’s biggest coal-fired power station on Friday as it swelters through an ongoing heatwave and power stations break down. It said there was a minimum energy reserve requirement of 3179 megawatts needed, however, the state only had reserves of 41 megawatts secured. This shortfall of 3130 megawatts is larger than Origin’s Eraring coal-fired power station, which is the largest in Australia. However, even as Victoria attempted to balance its tight power supply and demand levels, it still intermittently exported energy to New South Wales. Should this not read: “… before 1910 …” ?? All Australian temperature records which started after 1880 used Stevenson Screen as nothing else would have been installed. No. Paul some Stevensons were in place that early, but some were not switch to Stevenson screens until sometime from 1895 to 1910 when the Bureau officially opened. However none of the readings from early Stevensons appear to be used when the BOM announces a “record high”. It is as if none of that data exists. SA was early (Charles Todd) but NSW was late if I recall rightly. Worse than that Jo. The BOM claim their instantaneous 1 sec readings from the new AWS network are equivalent to the old mercury thermometer readings. The time constants of the two recording methods are totally different, but BOM say they are comparable. BOM claim to have undertaken extensive studies to show there is no bias introduced by the new reading method. Only problem is they wont release the the studies to non-government scientists. Very strong smell around all this. When comparing temperatures, not least record maxima, over time we should recall—as Jo has on this site (tho’ I forget when or under what title)—the different equipment for measuring temperature. The older mercury-based temperature gauges require that we allow perhaps as much a half a degree of difference when compared with results from the newer equipment. It makes today in SA roughly comparable with earlier experience. Horrible day, but not new. Fortunately the CFS site suggests a generally quiet day for their own units. Hospitals might be another matter. The proof that we were vulnerable to very high and widespread temps in 2019 are the very high and widespread temps of 1939. This is not, however, the way a 2019 mind is expected to work. Whether you are talking worst tornado (1970), worst cyclone (1899), highest heat (1960), worst drought (1895 onward), biggest fire (1851), longest heatwave (1923-4), highest death toll from weather (1939), biggest evacuation for heat (1896), driest bushfire season in crown fire regions (1943-4) or biggest flood (1955)…if it happened then, it was just weather. If it happens now…those creepy plutocrats and technocrats queuing for the lobster sandwiches at Davos must save us. That is exactly what is happening now, so I hypothesise that low pressure troughs and a blocking high in the Tasman produced the 1896 heatwave. Now all we have to do is prove this weather pattern is caused by a quiet sun. At the moment here the Sun is quite intense but you mention that another effect may be due to a quiet Sun. Are conditions now similar to the 1896 tragedy. Fortunately here on the East coast we are insulated from a lot of extremes but still have experienced difficult heatwaves back sixty or seventy years ago. This morning we had a cool rush of air from the south, but the heat arrived later. Are there El Jinks or La Ninas at work, I have understanding of these things at all. But seventy years ago we did look forward to the southerly buster late on summer afternoons. I can`t speak for the quiet sun, but watch the cloud mass off NW WA associated with TC Riley. That area of ocean and the mid-Indian have been barren of cloud cover for ages due to a neutral Indian Ocean Dipole trending negative with cold water off WA and a consequent lack of evaporation for cloud formation. The IOD is just the Indian Ocean version of ENSO with warm water sloshing from side to side and taking cloud cover with it as it goes. They now say that for most of Oz the IOD is more important than El Nino. Central Australia gets most of its big weather systems from the NW and the IOD. In the Hunter we get our excessive heat blown at us from the Centre and we pick up the remnants of those IOD rain systems too. A cooler, wetter Centre means a cooler Hunter Valley. If that cloud feeds SE over the continent things will temporarily improve temperature and rain-wise. There is bit of cloud action SW of Indonesia too. Things are starting to happen finally. We need a chain of rain systems to sweep across the country to do any good. The BOM predicts a full negative IOD by winter and a worsening drought, but the BOM has been known to be wrong apparently. From the outline you’ve given I may be set up to follow the next cycle that brings rain to our part of the world. Locally I’ve been up in the Hunter occasional for the last two years and have noticed the effect of the sudden dry on the kangaroo population; very few now seen on the sides of the road up to Singleton. That the valley goes from extreme dry to extreme wet is shown by the flood level marks at the Wollombi tavern. The locals say it floods there every twenty years or so, but only after the area is waterlogged. An interesting project to follow the next breaking of the dry. I keep telling myself to proof read, but he just doesn’t listen. Perth is a good example of extremes in mid latitudes, a few days of scorching heat followed by a sharp downturn in temperatures. So I argue that the collapse of the subtropical ridge in July 2017 has brought an end to droughty conditions in SWWA. South East Australia should also receive good rains in the Austral winter, which was the norm in the old days. ENSO remains an enigma, but we know El Nino was active in 1896-97, possibly the same as this moderate El Nino we are experiencing now. The collapse of the STR has produced blocking highs in the Tasman which is bringing lovely south east winds to the Queensland coast. I contend that all of this is due to a spotless sun. Interesting graph, lets see what happens. The northern hemisphere has had several years now of severe winters. Not living there it’s hard to say if they are just normal or extreme. The North Atlantic Oscillation is in a positive mood, so no UK whiteout. Theoretically, a quiet sun should produce a negative NAO and that isn’t happening at the moment. No furnace here in WA where we;ve had two rainy days at 23C or so. Pathetic. Where is summer? Quite so. Worse, in 2014, when many centres repeated the experience of record high temperatures: thus, for example, at Mount Gambier aero, the record set on 16 January was 44.1, repeated 17 days later on 2 February: 44.9. For Mount Gambier Post Office (1861–1952) the relevant dates are 19 January 1908 and 1 February 1912; at least a decent rest between dreadful days. The airport is about twelve kilometres north of the PO. But if one really wants worse (and what CAGW enthusiast doesn’t): that record in 1908 was the fifth consecutive day on which the temperature exceeded 40 degrees C (see here and here. Yesterday’s (as it is now) temperature followed three days in the low thirties. Does Tony Heller read this blog? He is interested in these sort of historical accounts of old temperature records. Only today he did this post on Bourke’s temperatures of 1896 versus 2019. Worth a look. To quote the TV quiz shows, history is all that stuff “before my time” all that matters is last year, this year and the approaching, unprecedented , sweltering armageddon! at least until autumn, then we start looking forward to snow reports. Last year around this time of the season Winton QLD reached 53C. Evaporative cooling wasn’t breaking even. Yet one of the locals was outside in the blazing heat mixing concrete! Probably had to put retardant in the mix to stop it going off too fast. Most of the locals thought it was a hot one but nothing unexpected or out of the ordinary. OT but worth noting is this story about when ideology and money are are used on a power project . Load shedding in sa obviously climate change initiated it snuck in one night and blew up playford etc. It’s so hot, you could fry an egg on a rock! On the hottest day in 14 years,Deputy Dawg gets to enjoy the cool comfort of the Sheriff’s icehouse as Vince and Musky attempt to infiltrate it. Quadrant has taken a similar look at fish die-offs. Looks like heaven rather than the end of the world, my British winter fingers are swollen itchy and sore with chilblains, I’d swap! I have lots of Facebook friends in Europe and North America. The pictures they keep posting are all white, and I don’t think it’s because it is hot. Today in Adelaide the current temp is 27C. I thought heat waves were meant to be longer. What is this? A heat splash? A heat droplet? A heat Meh? Those records don’t count, they weren’t on television. 117.7F in Adelaide on Fri.13 1939. Took 2 mins in the Trove archive to fine multipme articles. That translates to 47.6℃. The same as the claimed peak this time. I’m shocked at the total lack of faith in your elected government. Do you zombiephone-hugging, 200 per week, tv-cooking-show addicted plebs seriously believe your elected representatives don’t have YOUR best interests at heart? Are you suggesting they are only in it for themselves, courtesy of the political gravy-train-for-life ? I’m shocked, shocked I say ! Of course the fly-in-the-face-of 7000-years-of-socio-political-environmental data is a lie ! Would we lie to you ? After all, you can always ask us anything, but be sure to use the “we humbly pray” preface because we, your elected leaders, are GODS after all, and you the great unwashed should pray and humble yourselves in our presence. Believe what we tell you because you’re too stupid to understand anyway. We want brainless automoton factory wage-slaves, not free-thinkers ! Ever seen half a dozen people who caught Polio? 80 year old solves the Climate Modelers puzzle. Using simple modeling tools and data from a single BOM(Australia) site he is able to predict world temperature with standard deviations that closely follows the ninety or so years data available. Alas when the model gets to 1997 and beyond it had to be adjusted so that it could predict the temperatures from the ‘Real’ data. This was achieved, but the computer code had to be carefully skewed so as to get CO2 PPM as the modifying factor. The model was able to predict within the standard deviation temperatures up to 2007. Armed with this new model it was let rip to 2017 then to 2027 then to 2037. The new model showed ALARMING upward trending temperatures. It even showed a hockey stick shape! BUT the ‘real’ data to 2017 was persistently below what the Model predicted and the bottom of low standard deviation was soon above the actual ‘real’ temperature and by 2017 the bottom of the low STD was above the ‘real’ temperature and from there the predictions made little sense. Then the 80 year old LOOKED at the data. There was a distinct jump in the ‘real’ temperatures in 1997/8 and from that year the temperatures NEVER dipped to anywhere near what it’s noisy 3/4 century trends had been. The post 1997/8 temperatures were persistently up there and never came back down. Using anomaly the 80 year old checked and found that in 1997/8 NEW equipment had been installed, could this 1.25 degree jump be the cause of the models failure to predict very well. The 80 year old copied the ‘real’ data up to 1997/8 subtracted that pesky 1.2 degrees from all the post 1998 ‘real’ temperatures, ditched his adjustments and re-ran his model. It tracked almost perfectly right up to 2017, showing a very small upward trend. The new ‘real’ temperatures were squarely located within the STD predictions. Letting the model run forwards and this small upward trend was just visible at about 0.3 degrees by 2100. Real climate modelers are being fed RUBBISH. There was NO 1.3 degree upward step in 1997/8 that persisted to 2018…. To adjust a model to follow this false data inevitably produces a model that predicts ever rising temperatures way beyond any useful prediction! Give the modelers data that is consistent and they can and will produce meaningful predictions. Give them false data and they cannot be expected to produce predictions that do anything except become more and more inaccurate!!! Could this explain why the Russian model is so much better than all the rest. Could it be that the data the Russian modelers are using is good old Russian data??? If so their predictions are really long term Russian temperature predictions not global ones!!! Sorry if this was posted already, but didn’t see it in a quick scan of the comments. Really, the skepticism should be aimed at the likes of Big George – already proven he can’t be trusted. He and others on his side, profit from both the taxpayer AND the mining industries. I am reminded of the skepticism we all once had about smoking being bad for us. That skepticism was fueled and funded by the tobacco industry. Or how about companies who knew about asbestos but kept schtum? Details from the Conversation Fact Check make perfect sense. Except to professional “skeptics”. Nice try. But not even close. The (non)Conversation post is the usual Strawman attack. The Bom leave some of the 1896 data on their supposedly “raw” CDO offerings (which are often adjusted). But they never mention them in public. The history disappears down the memory hole even though technically some of the data is still available for the 0.0001% of the Australian population who bother to double check what the BOM says in media releases. The FACT is you won’t find BOM press releases that make sure Australians are aware of how incredibly hot the 1800s were. There are scores of super hot temperatures in our archives. Are they all wrong? Even if some are 1 -2C high (as I said in the post) that still means dozens of readings at 49 or 50C and all over the country and sometimes also recorded on independent equipment 100km away on the same day. So all the people who settled Australia and survived without electricity, airconditioning or cars were too stupid to measure the temperature. Some readings were probably on the new Stevensons which were being installed around the country. Some were at Observatories by trained staff, but the BOM “knows” 100% that all these are not even worth assessing. They add no caveats to their propaganda, they show little interest in analyzing and discussing our history. How much do they care about our actual climate history? Barely at all. As for the tobacco slur, this is cheap smear-by-association. Surely you can do better than that? If there are similarities it’s that the vested interests (banks and renewables) want to deny debate and evidence and cast doubt on the thousands of independent unpaid scientists who are speaking out about this scandalous profit making scam called “renewables”. Why should we bother with “bombs away”. Your comment is already on the verge of total mental decay. A sad sack, so to speak. It is hard left-wing propaganda. But I’m guessing you already knew that when you cited it. Speaking of facts, do you have any empirical evidence that an increase in atmospheric CO2 causes warming? Can you provide some actual measured scientific evidence of the very basis of the AGW farce ? My post was held up by your moderator who also took it upon him/herself to lecture me about logic – the very thing that is anathema to climate “skeptics”. I note no such issue with actual examples of flawed logic scattered throughout these comments. Why? Could it be confirmation bias causing the blindness? He or she took exception to any comparison between this and the Tobacco Industry secretly funding “science that found smoking ain’t so bad after all! Or in various companies wjo hid their knowledge about the danger of asbestos. Those are perfectly legitimate comparisons. What is most assuredly not legitimate is your attempt to suggest that science, scientific tools and standards of maintenance of over 100 years ago are somehow equivalent to what is current. How about medicine? I hear cigarettes will cure a whole host of problems, or they supposedly did 100 years ago.. What about construction and associated standards? Any comparison there? So we have gone from Big George’s even bigger conspiracy theory about data being disappeared… to the reluctant admission that… well no… the information is actually there…. but trust me! most people are too dumb to find it! Science insists on standards. It insists that apples only be compared to apples. The data you desperately cling to, is not even an orange – it’s a lemon – obtained in variable, often sloppy conditions. The results of this 61-year experiment show that summer daytime temperatures measured using the Glaisher Stand are, on average, 1C warmer than in the Stevenson Screen. And this was at a well-maintained station – if a Glaisher Stand is not used properly, direct sunshine can fall on the thermometers, dramatically increasing the warm bias (and this was probably what happened at some stations, given that we know equipment was not always well maintained). In short, the experiment shows an average 1 degree higher temperature, but that was for a well maintained station. The real figures for the era were likely affected far more than that. GP – you seem confused. You do realize that tobacco is not a climate forcing? As for your claim (haha) that we are suggesting people are too dumb to find the BOM buried data. This is like your doc prescribed you a drug then blaming you for being stupid because you didn’t search PubMed yourself for drug interactions when you went home. Smart patients expect their doc (or their BOM expert) to tell them all the facts that matter. Disappointing isn’t it to find the massively well funded “Conversation”/academic is so weak that it falls over with a mere poke from an unpaid blogger? It’s true that ones done in the 1800s are often recorded on non-standard equipment, or are just literally “in the shade” under cover. So some of these, perhaps many, are one or two degrees too high. But even if we take two degrees off, how scary is global warming when Australia knew many days of 48C and 49C and some at 50C 120 years ago. Perhaps you should read my posts before you comment? And since you wonder, why don’t you also read Warwick Hughes reply to Nicolls? I take it your attitude is that people were stupid in the 1800s (they couldn’t manage to use a 200 year old technology) and every single one of the high temperatures were wrong. Who’s talking “conspiracy” now? “Why should we bother with “bombs away”. WHY? I don;t know – but you just did. With ad hom in lieu of actual intelligent rebuttal. Ad hom is a recognized logical fallacy – that is very popular in certain circles on the web. I wonder why the moderator here never gave you a lecture? Hmmm. And you follow the ad hom with the ever popular “let wing card. You can go fish on that. And finally… you give us the full splendor of your ignorance by limiting climate change down to just CO2. This conspiracy theory is the daddy of them all – involving the vast bulk of climate scientists, governments, bureaucrats, and Lawdy knows who else. PS Don’t look under your bed. I’m pretty sure there is a commie under there. For guy whose main argument is ad hom, you won’t get far complaining about other people reflecting your own fallacies back at you. Both sides of the climate debate have funding issues. But only one side tried to hide that source of funding. Can you guess whose side that was? I have no idea if anyone here is spouting propaganda for pay – and I don’t care. Some “skeptics” do – that’s the point. This is all about stopping renewable research and roll-outs to keep the oil flowing and the coal making its way to Parliament House for Show and Tell by the kiddies in charge. So gpfloor, are you in denial of a “left wing”? This is all about stopping renewable research and roll-outs to keep the oil flowing and the coal making its way to Parliament House for Show and Tell by the kiddies in charge. And WE are the ones spouting conspiracies? You sir or ma’m are loony. You sir or ma’m, by virtue of your own nonsensical expressions, appear as tho a lunatic. I’m sure you appreciate candor in an honest opinion. gpfloor is a biped, and so are tobacco execs. gpfloor eats with his teeth, just like an asbestos boss. I’m not accusing gpfloor of anything. I’m just sayin’. Some people push tobacco and asbestos, and they have the same number of feet as gpfloor. I don’t care. “GP – you seem confused. You do realize that tobacco is not a climate forcing?” Why, yes I do. Nice red herring. Tobacco bad for you. Those with vested interest in ongoing sales of tobacco, secretly funded “science” to counter that it is bad for you. Global warming. Bad for planet. Those with vested interest (oil and coal companies) secretly funded “science” to “prove” to spread doubt about the science used. “For guy whose main argument is ad hom, you won’t get far complaining about other people reflecting your own fallacies back at you.” LOL. Ad hom is attacking the messenger. I have not attacked anyone here personally. I have attacked ideas only, and the agenda of climate “skeptics” generally. “As for your claim (haha) that we are suggesting people are too dumb to find the BOM buried data. This is like your doc prescribed you a drug then blaming you for being stupid because you didn’t search PubMed yourself for drug interactions when you went home. Smart patients expect their doc (or their BOM expert) to tell them all the facts that matter.” BOM HAS told you all the facts that matter. That you insist BOM should include you lemon data with it’s apple data, is your problem. It has been “disappeared” as Big George alleged. It is there for anyone curious enough to look for it. “gpfloor is a biped, and so are tobacco execs. gpfloor eats with his teeth, just like an asbestos boss. I’m not accusing gpfloor of anything. I’m just sayin’. Some people push tobacco and asbestos, and they have the same number of feet as gpfloor. I don’t care.” LOL. Nice try. The point of what I said was in regard to the wringing of hands and crying over the comparison to the tobacco industry funding of what we could call “counter-science” in its effort to keep pushing its wares. The same is happening in Climate-skeptic-Land, and for the same reason: greed. So the comparison stands – even if no one here in particular is part of that paid propaganda effort. “As for the glaring admission, it’s an omission I didn’t omit. I’m so well aware of Nicholls et al I even referred to it in the post. First paragraph. Guess which paper I was thinking of here” It is a passing reference without naming what you were referencing – and incomplete because it fails to take into account all the variables mentioned that would have increased the size of the errors significantly. “PS: How do you know the moderator has not lectured him, you all omnipotent pundit? We email him…” You email him? How often? About what? I was publicly lectured. He wasn’t. The lecture I got was not accurate in it’s criticism. On the other hand, “Your comment is already on the verge of total mental decay. And EMPTY HUSK with zero content. A sad sack, so to speak. are blatant personal attacks. Ad hom. Post the email/s sent. Global warming. Bad for planet. simplistic assertion and by no means proven nor is it supported by scientific analysis of the history of Earth. Those with vested interest (oil and coal companies) secretly funded “science” to “prove” to spread doubt about the science used. I have attacked ideas only, and the agenda of climate “skeptics” generally. But you are completely ignorant of MY agenda which is simply to stay warm at an AFFORDABLE cost! This is real to me and unless you are really really certain that your unproven hypothesis is really valid then my staying warm trumps your collective imagination. I dare you to hang around here long enough to earn some respect. As of right now you are a whining brat with a big mouth. Time to prove you have it in you. Start with a modicum of humility, respect for the other humans that inhabit this space. Naw I bet you can’t take it, You’ll be gone in a week. Or maybe you are John Cook? then you’ll be gon in a day. The attack was at your post, not you. It was basically just an empty rant. Maybe you can do better, probably not. And then you produce yet another whinging post with zero content. Now, have you got any scientific evidence for warming by increased atmospheric CO2?? I completely agree on the importance of civility. Most of this debate starts and ends with denigration and namecalling rather than debate. You don’t need to be a climate scientist to know that one side of this debate labels the other side as “deniers”. (As if they have lizard-brains incapable of reason, or are sympathetic to Nazis). This is a cheap smear tactic designed to stop people discussing the science (a debate skeptics win nearly every time). One side of the debate refuses to debate in public (we keep offering, but professors are too afraid of looking stupid if they can’t answer questions and they lose.). The only way to know who is right scientifically is through the empirical evidence — the observations. But even non-scientists can see that believers are afraid of skeptics arguments, afraid to debate, use namecalling and “consensus” as if they were scientific. They say the evidence is so overwhelming and the future of the planet depends on getting everyone on board, but they refuse to debate or discuss their evidence. PS: Almost all my support comes from individual mums and dads. Not corporates. Not billionaires. No “foundations”. Not fossil fuels. I’d have made five times more money if I was a climate believer. So would my husband. What a coincidence that you are both here together at the same moment in time. And isn’t it just heartwarming that one admires the restraint of the other. You should take advantage of this quirk of fate and get together, maybe on your own blog? Maybe you already know each other? I only wandered into these pages because I am a teacher looking for examples of sound, rational and well constructed arguments to use in my teaching. Well informed “teachers” would engage in a systematic search of the net, in contrast to “wandering.” It is most unlikely they would engage while on an analysis and cut and paste task. Furthermore, “teachers” these days never expose their propagandised brain washed children to the counter-argument. The danger of revealing the genuine science and debate appears simply too great. They’d lose the smartest members of the class in minutes, and they trigger a portion of the balance 1SD above the mean to research for themselves. They’d go on preaching to a proportion of those 1SD below the mean, but they’d know that in the end it was possibly or probably quite pointless. There is quite a lot of traffic coming here from Facebook. Can you tell me what you read that linked to this page? We now live in a climate controlled society. It’s 24degs at home, in your car, at school, at work,shopping centres, public transport etc etc. No one acclimatises any more, it gets to 30 we complain it’s too hot and it’s all about climate change. I can remember all the people in our street sleeping in their front yards because it was too hot to sleep inside. My dad putting the TV in the front window. This article confuses weather with climate. Weather is how things are at this time. Climate is the average of weather over time. January 2019 was the hottest on record. The hottest 17 years on record were all since 2000. The only year not on this list was the year the Icelandic volcano filled the air with dust which had a cooling effect. the evidence is profound, yet there are people who seem otherwise intelligent, who for reason of their own don’t want to believe that we are changing things and the changes are not good. Garry, did you even read the article or are you a bot dropping in the latest irrelevant agitprop? My apology, I thought it was Global Warming now it’s Climate Change. And I completely stuffed up the difference between Weather v Climate. How silly of me. I thought it all had something to do with the temperature? What has the greatest volume? A glass of water or a frozen glass (the same size) of ice? If this information is correct, what does the powers to be think.